I'm so excited to announce that on June 6th, my boyfriend proposed! And... I said YES! Yes, I'm finally ENGAGED! I say finally because.... well, I'm not in my 20s anymore and we've been together for three wonderful years, it is just about time for me. He took me out to a great restaurant in the Distillery District in downtown Toronto. He got down on one knee and asked me to marry him! Through my tears, I managed to say yes and have been blissfully happy (and on the verge of tears) ever since. 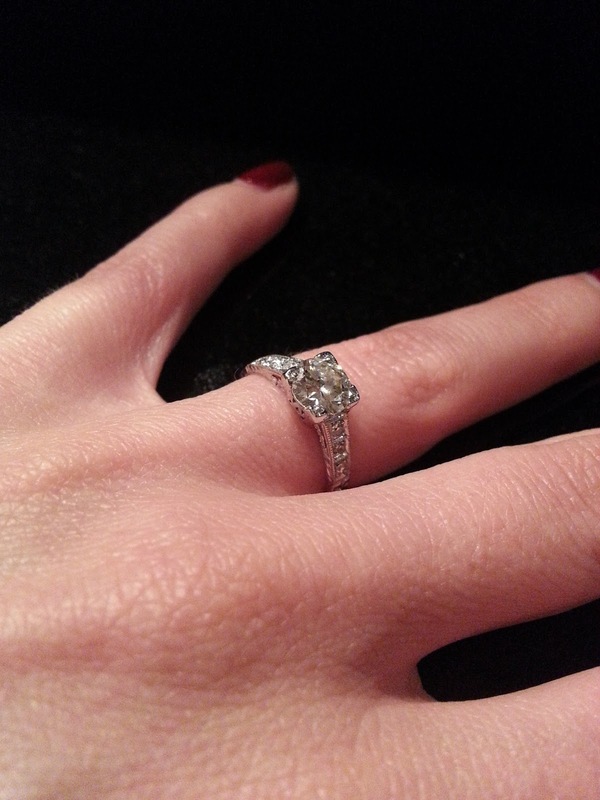 The best part (of course) is the amazing engagement ring he gave me. It is always about the ring! When we first started talking about getting engaged last year, he asked me what kind of ring I wanted. Well, of course, I said I wanted a vintage ring. It was such a simple and easy decision for me to make. I knew that I didn't want a giant, mass produced, what every other girl has, type of ring. I wanted something unique and that when you looked at it, you would say 'oh, that's totally Kim'. My boyfriend very quickly realized that finding a vintage ring wasn't all that easy. We started browsing online and found a lot of great shops... but they were in New York, not Toronto. Buying a ring online just didn't seem like a good idea and taking a trip to New York just wasn't in the cards. So... we kept searching and were so lucky to have discovered Antiques on King right here in downtown Toronto. We went in and were amazed to see that they had hundreds of stunning vintage engagement rings for us to choose from - it was quite overwhelming for me! We sat down, and my boyfriend (who has amazing taste) quickly found one that caught his eye and asked if we could try it on. That was the ring... the very first one he picked out. We tried on many others, but always found ourselves coming back to that same ring. It was just perfect and fit me like a glove. It was meant to be. So, now begins the planning. My fiancee is very modern, while I'm more on the vintage side. We plan to create a wedding that beautifully combines both of those elements. Here are some of my inspiration pictures that I've pinned on Pinterest. I'm so excited about this next year! Not only do I get to marry the man of my dreams, but I get to plan the party of a lifetime. Congratulations Kim!!! Sounds like it will be a gorgeous affair! Wow! Congrats! Very exciting time for you. Have fun with all the planning, and choosing all the wonderful details. Cute pic of you two. Congratulations to you both and best wishes! 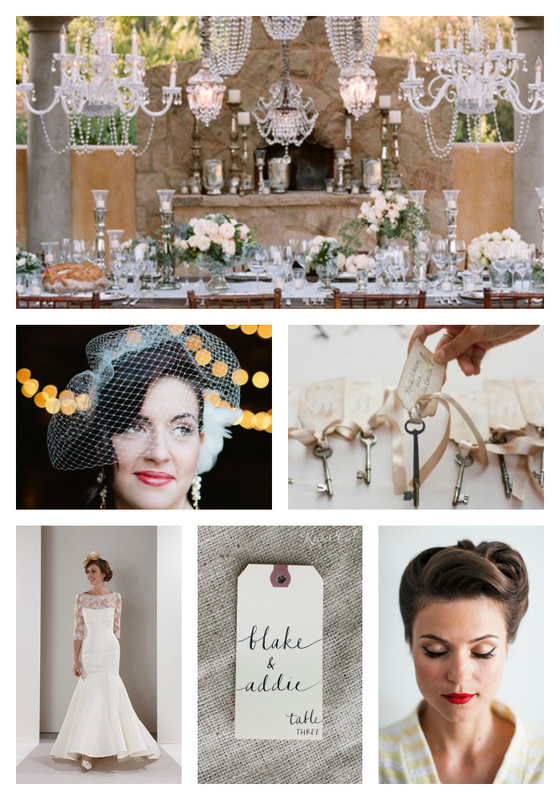 It will be so much fun to plan a vintage wedding - enjoy! Beautiful pictures & post! Congratulations to you both! You are gorgeous and the ring is stunning! Congrats! Kim, best to you and the groom! I am so happy for you. Wedding bells are going to chime! Your vintage ring is so stunning! Love to you both. Congratulations!! Your ring is beautiful, no doubt!! Congratulations and Best Wishes. Love your ring. 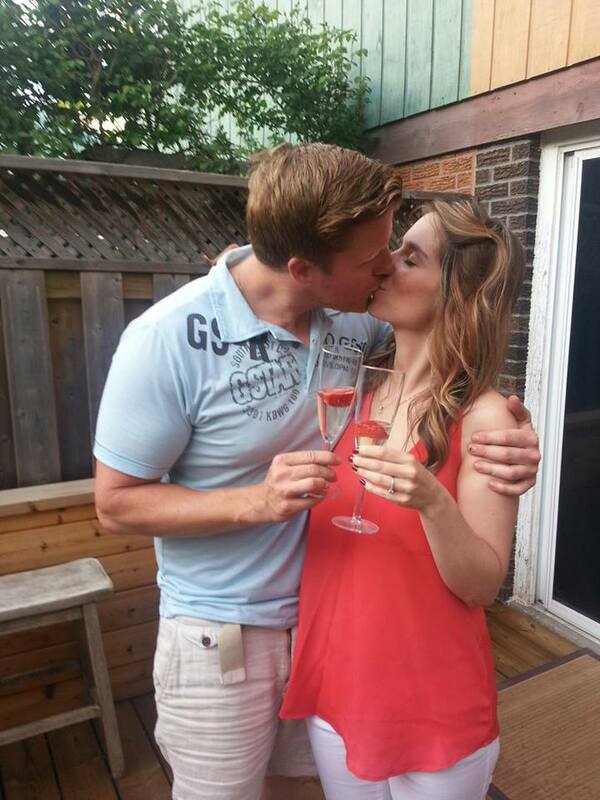 Big congrats to you both! Can't wait to see the wedding pix!! 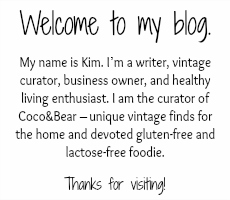 Congratulations, Kim! It's a really beautiful ring! I wish you both all the best! Yes congratulations on your engagement!! But really the gluten free doughnuts caught my eye. My whole family was diagnosed with celiac disease 15 years ago. and I haven't had a dough nut since (Which I love!!) this may have kept me relatively thin but not happy. My husband loves to cook and he will love to cook these. I hear ya Nancy - I was also missing donuts! You need to try this recipe - it's so good!